Full ProcedureFlow Knowledge Management Software review - all you need to know about ProcedureFlow Knowledge Management Software | Skyose - All-In-One Platform For Guides, Tips and many more. ProcedureFlow, a cloud-based knowledge management software, is designed and developed to help you transform your employees into experts faster. ProcedureFlow makes it much simpler to follow the processes within a company or organization. The use of the software help reduce the time spent by a company in training and mentoring by 50% to 90%. ProcedureFlow helps organizations and businesses be the best they can be. No businesses or organizations wish to deliver poor services or bad products to customers. A business or an organization starts with an aim to bring value to its customers and offer the customers something special and unique. As the business expands or grows, it becomes difficult to keep the uniqueness or the specialty that the customers like. With the growth, there come inconsistencies and the best practices do not get shared in a proper way. The aim of the ProcedureFlow software is to help an organization or a business capture their best practices in such a way that they can easily be followed and shared across the organization or the business. This procedure results in the increase in the quality of work and also good customer experiences. ProcedureFlow helps you in turning the processes and expert information of your organization into an easy-to-use and easily accessible management tool. Let us discuss how this software works. The first step is to interview a subject matter expert. In 16 to 20 hours, you are able to create flows that instantly guide new employees through what would require 3 to 5 days of classroom training in general. In the second step, you use the flows and check the results. The new employees are confident because they follow and learn the connected procedure flows. Therefore, they need minimum mentoring. Also, they will produce greater quality work and finish their work faster or their productivity will increase. The third step is to improve with use. The users are able to quickly submit changes and also get them approved. This results in the engagement within teams. Moreover, this promotes the sharing of best practices. The use of ProcedureFlow minimizes the time required for training. This software enables you to represent expert knowledge as a visual map. Thus, you are able to give your employees the confidence to start a work sooner. The customers of the software are consistently reducing training time by 50% to 90%. You can enhance the quality of your work using ProcedureFlow. One may think that the reduction in training hours may cause a reduction in the quality scores. However, the customers of ProcedureFlow have experienced double-digit increases in their quality scores. ProcedureFlow helps you in reducing the time spent in mentoring. Normally, it takes almost 6 to 12 months to ramp an employee to proficiency. By using this software, you can minimize the time spent on mentoring by almost 50%. For example, if the mentoring hours required for a new employee in your organization was 6 months, it can be reduced to 3 months with the help of ProcedureFlow. Using the ProcedureFlow software, you are able to complete your tasks faster. As this software enables you to use best practices and subject matter expertise, you are able to complete your tasks quickly. In general, the time taken to perform a task in the right way is less compared to the time taken to explain why you did it wrong. This software helps you in visualizing your process with the help of flowcharts. It offers seven simple shapes to create an attractive flowchart. A flowchart can represent complex expert knowledge. The seven shapes available in ProcedureFlow are Action, Decision, Data, Backstory, End Point, Critical, and Plain Text. The blue Action represents the direct action you should take on the call, e.g. asking a question or clicking a link. A choice is represented by a yellow Decision diamond; you should follow a different route based on the answer. The green Data parallelogram represents information that you have to collect or you have to remember. The purple Backstory represents a concept or an idea that helps you understand why are you performing a task. The End Point represents the termination of a call. When you insert any information inside the red Critical shape, it means that the information is very important to your business and it can have a huge impact on your business if ignored. Lastly, the Plain Text shape enables you to insert text on the editing canvas. To make your flowcharts more visually attractive, ProcedureFlow lets you add images and text to the flowcharts. You can change the font, font-size, and font-color of the text or make them bold and italicized. When you work through your processes in a logical and visual manner, it helps you in spotting waste and making improvements right out of the gate. Using ProcedureFlow, you are able to create sub-flows within your main flowchart. Sometimes, an idea with many conditions can be complex that cannot be represented with the help of a single flowchart. 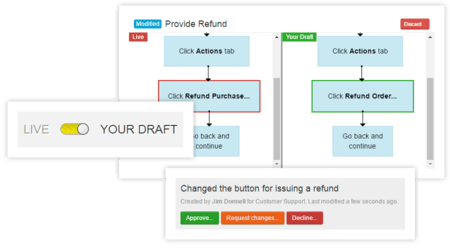 In this case, the software lets you create sub-flows so that you do not have any trouble in representing your idea as a flowchart, regardless of its complexity. ProcedureFlow helps you to assemble your team in a single place. You are able to add new members easily and quickly by searching their names or email ids. You can also send user invitations by their email id, and the process is very intuitive. Using ProcedureFlow, you are able to assign ownership to your team members according to some criteria such as their designations. There are some ownership levels such as ‘Viewer’ who can view only the approved changes; ‘Contributor’ who can submit changes for approval; ‘Approver’ can approve the submitted changes; ‘Admin’ can add or remove members, rename entry point, etc. The process of granting permission is simple and intuitive; you can give the IT team of your organization a well-deserved break by performing this task on your own. With various features such as instant title search, star flow, and backflow makes it easy to manage the flows and sub-flows. The instant title search feature helps you to search for any sub-flow from a search box by inserting a work or a phrase present in the sub-flow. If you use a sub-flow quite frequently, you can make it a star flow just by clicking the star present at before the name of the sub-flow. When you return from a sub-flow to the main flow, the sub-flow you last visited will be highlighted with yellow color. This is known as ‘backglow’. This helps you in easily remembering the last sub-flow you visited. ProcedureFlow lets you create a draft that can be edited by your colleague in real-time. For example, your colleague may suggest to change the button for an action. After you complete your draft, you should enable the ‘Live’ option so that your colleague can view it and edit it. You can compare the draft in which your colleague has suggested changes with your original draft. After you made all the desired changes to your draft, you can submit it for approval. The first step is to ensure that you Save and Close any flows you are working on. Second, click Review Your Changes. Third, provide a title to your change set. Fourth, click Submit For Approval. You will see a confirmation bar saying that your draft has been submitted for approval. Until the draft has been approved, you changed will not replace the live version. Using ProcedureFlow, you are able to monitor the changes made to a flow by your team members. As all the team members can make changes to the flow, it is necessary to keep track of who has made what change and when. Everyone in your team is kept up-to-date with the latest process changes with the help of change notifications. You are also able to see the changes made to any process in the ‘Change History’ section. ProcedureFlow enables you to run a quick report to check which of your employees are looking at their change notifications. In the report, you can see the number of unreviewed changes against the names of your employees. This software also allows you to view the last active dates of your employees along with their names, email ids, and roles. You are able to view the names of the employees who have recently logged in. It helps you in coaching the employees who are falling behind. ProcedureFlow offers a free trial for 15 days. After the free trial expires, you have to opt for an enterprise pricing package. The vendor offers many enterprise pricing packages. You can contact the vendor with your requirements, and they will get back to you with the quote as per your requirement. If you have any queries related to the pricing, you can contact the team at sales@procedureflow.com. Or, you can call them at 1-888-827-3918. ProcedureFlow is a web-based software that supports devices with Windows and Mac operating systems. The deployment model of this software is cloud-hosted. It is suitable for small and medium businesses. The language supported by the software is English. The ProcedureFlow team offers support via phone and email. You can reach out to the team at 1-888-827-3918. You can also mail your query to the team; the email id is help@procedureflow.com. The business hours of the vendor are from Monday to Friday (7:30 am to 3:30 pm EST). All the support queries are assigned a severity level. There are a total of four severity levels: Severity 1, Severity 2, Severity 3, and Severity 4. If the ProcedureFLow software is unavailable or users are affected because of data integrity issue and there is not any known workaround, you can assign these issues Severity 1. The initial response time for the issues in Severity 1 is one hour or less. When the performance of the ProcedureFlow software is greatly affected for most users, and there is a workaround that is not reasonable for a longer period, the issues will fall under Severity 2. The initial response time for the issues with Severity 2 is four business hours. If there is a bug with the software that affects a limited number of users and there is a reasonable workaround too; the issues of this type falls under Severity 3. The initial response time for the issues under Severity 3 is 24 hours. 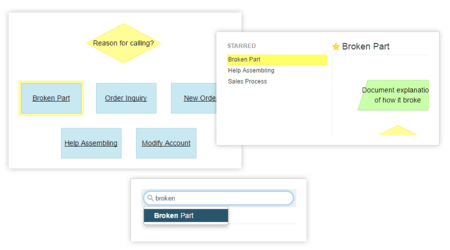 Queries related to product training and feature requests are categorized under Severity 4. The initial response time for issues under Severity 4 is 24 hours. The vendor provides 24/7 support for all the issues of Severity 1. If you have any Severity 1 issues and you want help after the business hours, you can call the team at 1-888-827-3918. All the issues of Severity 2, 3, and 4 are resolved during the business hours. You can also fill out the form present in the webpage https://help.procedureflow.com/contact to contact the support team of ProcedureFlow. You can access the Help portal of ProcedureFlow by visiting the webpage https://help.procedureflow.com/. In the nifty search box present in the webpage, you can look for any topic in the knowledge base. Under the nifty search box, there are links to a few most popular articles related to ProcedureFlow such as ‘Add Entry Point Members’, ‘Starring a Flow’, ‘Creating Subflows’, and many more. Just below these articles, there are some sections, and they contain various articles related to the sections. The ProcedureFlow is a cloud-based knowledge management software that converts the processes and expert information of your business or organization into a simple, easily accessible, and easy-to-use management tool. By managing the processes properly, the software delivers benefits to all the areas of your business. The use of ProcedureFlow in your business reduces the time needed to train new employees by more than 50% and also increases the quality of work delivered by your employees. It reduces the mentoring time spent with the new employees by almost 50%. Moreover, the use of best practices and subject matter expertise helps in completing the tasks faster.